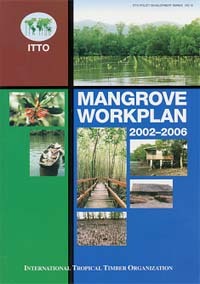 ITTO Mangrove Workplan 2002-2006 is available! ITTO has recently adapted its Mangrove Workplan to provide guidance for the Organization's future work in promoting the conservation, rehabilitation and sustainable management of mangroves for the years 2002-2006. The Workplan gives insights into the area of activities to be implemented during 2002-2006. The ITTO Mangrove Workplan 2002-2006 is available from the ITTO Website, under Publications -Policy papers & guidelines.